In my last post I discussed three of the traditionally defined types of validity: criterion-related, content-related, and construct-related. Now I will talk about how your organization could undertake a study to investigate and demonstrate criterion-related validity. So just to recap, criterion-related validity deals with whether assessment scores obtained for participants are predictive of something related to the goal of the assessment. For example, if a training program conducts a four-day sales training course, at the end of which an exam is administered designed to measure trainees’ knowledge and skills in the area of product sales, one may wonder whether the exam results have any relationship with actual sales performance. If the sales course exam scores are found to be related to/predict “real world” sales performance to a high degree, then we can say that there is a high degree of criterion-related validity between the intermediate variable (sales course exam scores) and the final or ultimate variable (sales performance). 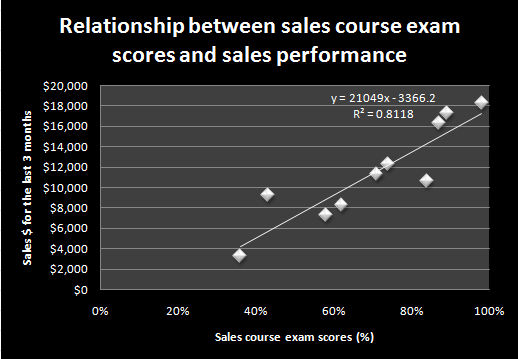 So how does one find out whether high scores on the sales course exam correspond to high sales performance (and whether low scores on the sales course exam correspond to low sales performance)? Well, within an organization there may be some “feeling” about this, for example instructors seeing star students in the course bring in big sales numbers, but how do we get some hard numbers to back this up? You will be glad to hear that you don’t need a supercomputer and a room full of PhDs to figure this out! All you need to get some data on this are some good assessment results and some corresponding sales numbers for people who have gone through the course. 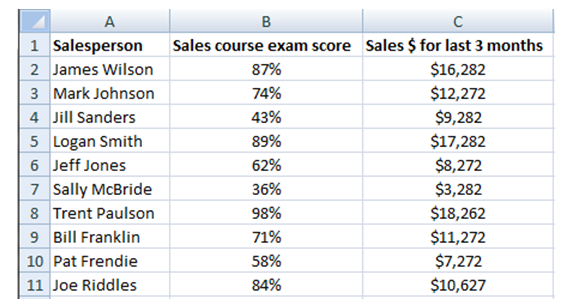 We find the correlation is 0.901, which is very high positive relationship (people with higher sales course exam scores bring in more sales dollars). This would suggest a high degree of criterion-related validity in that the sales course exam scores do indeed predict sales performance. To go one step further, you can take the equation produced in Excel included on the scatter plot trend line and for new sales people taking the sales course exam you can predict how much sales revenue they might bring in: y = 21049x – 3366.2 (y=estimated sales performance in dollars, x= sales course exam score). Suppose a new sales person (Rick Thomas) obtains a sales course exam score of 73%. Just plug this into the equation and y=21049(0.73)-3366.2 = $11,999.57. Voila! Based on his sales course exam score, Rick Thomas can expect to bring in about $12,000 in revenue in the next three months. With more people analyzed (we only have 10 in this example), the greater confidence one can have in the correlation coefficients obtained and the predictive equations garnered. In “real life” I would want as many points of data as possible: hundreds of salesperson data points or more. I will focus on content validity in my next, so stay tuned!